...And nothing does that better than a steaming bowl or two of stew! 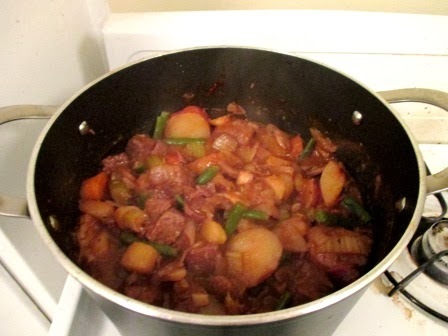 According to my research, a stew is a dish of meat and/or vegetables slowly cooked in a closed pot or pan. As far as I'm concerned, this definition is broad enough to include any simmered dish, from a traditional beef stew, to a chili, to a curry! That being said, for the next two weeks, I'll be showing you to make stews inspired by the flavors of the Philippines, Thailand, India, the UK, and even North America! These recipes are not for the calorie counters and low carb nuts. Those people will probably spend the rest of the winter shivering from poor nutrition. This is for those of us that know that a little meat on the bones (no offense to any vegetarians or vegans out there) is important to get us through January and February without freezing to death. For those low cal and/or low carb nuts now ticked at me, I say: STEW ON THIS! Every country seems to have a version of Beef Stew, but the flavors we know are typically associated with old recipes from the UK and France. One Irish pub in Montreal even boasts that their recipe dates from the 1800s. 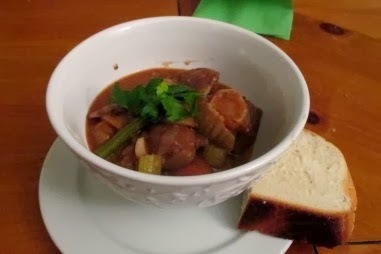 When one thinks of this stew, one thinks of chunks of beef and root veggies simmered in flavorful broth thickened with potatoes and flour, and I don't intend to disappoint. However, I notice that some stews don't have much taste to 'em beyond salt, pepper, beef, and the occasional hit of Guinness, beer, or wine. So I looked at a bunch of recipes and tried to come up with my own. While this recipe serves four to six, if you live alone or there are less of you, you can keep what's left in the fridge for 3 to 4 days, or for 2 to 3 months in the freezer. 3 Tablespoons of Tomato Paste - Optional. This, along with the starch from the potatoes, is what's going to thicken your stew. Some people like their stews liquidy, others like it thick, so it's up to you. 2 Pieces aka Cloves of Garlic, peeled and sliced, with the tough woody bit at the end removed. To peel the garlic, put the clove on its side, put the flat part of your knife on top, and CAREFULLY, WITHOUT CUTTING YOURSELF, whack the flat of the blade firmly with your palm, crushing the garlic beneath. The peel will come right off after that. 1 Pack of Regular Mushrooms - Sliced - Beef and Mushrooms are a match made in heaven. Even if you don't like mushrooms, give them a shot in this stew. You will thank me. The small, cheap white ones you get in the tubs in grocery stores will do just fine. 3 Parsnips - Sliced - Parsnips look a lot like carrots... except that they're white, and a bit sweeter. Try them. 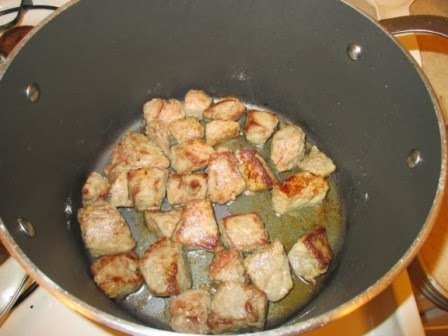 Dump your stewing beef in a bowl, add some salt and pepper and the flour and mix it with your hands until the beef is evenly coated. If you're using bacon, cut it into tiny pieces using your trusty knife and cutting board. Heat your pot to medium heat and dump in your bacon. Stir the bacon around with a wooden spoon until the fat cooks out of it and the bacon is brown around the edges, see the image below. You can then dump in your beef and cook it until it's brown on all sides. This process is called "browning". Scoop the meat out using a slotted spoon and put it in your trusty mixing bowl or any receptacle that can hold something hot and set it aside. 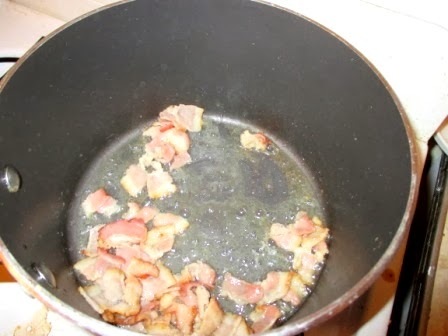 If you're using oil instead of bacon, heat the oil in the pot on medium heat and dump in the floured meat and cook it until it's brown on all sides. As you would if using bacon, scoop the meat out using your trusty slotted spoon, and put it in a bowl or any receptacle that can hold something hot, and set it aside. Check your pot. If there's enough fat leftover to coat the pan after browning the meat, with the pot still on medium high heat, dump in your chopped onions, mushrooms, carrots, parsnips, and celery. If not, put a little oil in the pot, and then dump in your veg. Add some oregano, salt, pepper, and the bay leaf and stir the vegetables around until they're soft and the onions are translucent, about 4 minutes. Dump in your garlic, and cook it for another minute or so. Add your beef back into the pot, along with your wine and beef stock. Give it a quick stir, raise the heat until the liquid is bubbling, and then put the heat on low, cover it, and leave it to simmer, stirring every 5 or 10 minutes, for at least a half an hour or until the meat is chewable. Add your potatoes and continue to cook until they're slightly underdone. To test one, scoop it out, and without burning yourself, taste it. If it's a little crunchier than you'd like, good, you can now dump in your beans. When the beans are tender, you're good to go... unless of course, the stew isn't thick enough for your taste. If it isn't dump in the tomato paste and stir until it's thickened. Add butter or margarine and stir until it's melted. This will give the stew added richness and make the broth shiny. Find the bay leaf using your trusty spoon and take it out. You can now scoop your stew into bowls and serve as is, or, if ya wanna get fancy, you can top with a little washed, chopped parsley. 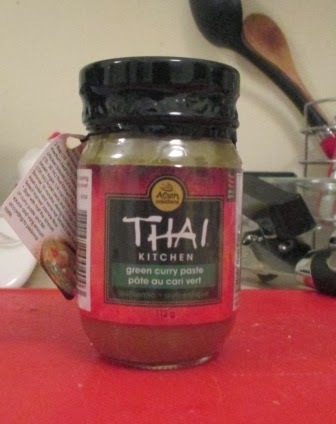 1 to 3 Teaspoons of Green Thai Curry Paste - This is a paste consisting of garlic, lemongrass, green chillies, Thai ginger, coriander root and other flavors. The amount you use will depend on how strong and spicy you like your curry. You used to only be able to get this in Asian markets, but as Thai food gets more and more popular, you can now find it in most major grocery stores In case you don't know what to look for, here's a photo of a popular brand. 1 Can of Coconut Milk (400 mls) - If you can get to an Asian Market, buy it there, as major grocery store chains, while they do now carry coconut milk, often overprice it. 1 Teaspoon of Thai Fish Sauce (Optional) - This is a traditional Thai ingredient made from dried fish. Whether you like it or not, it is also a key flavoring in many Thai dishes. However, if you can't use this for religious reasons or any other dietary restrictions, or you're simply put off by the fishy smell, don't use it! If you're feeling brave and want to give this a go, try to get it at an Asian Market, Asian markets will have bottles of varying size and price. Here is a picture so you'll know what to look for. This sauce can also be used diluted with a little sugar and water as a dip for spring rolls, or in marinades. 2 or 3 Leaves of Fresh or Thai Basil - Thai basil is a bit darker in colour and stronger in flavor than the basil we know, if you can't find it, use regular fresh basil instead. 1 Peel of Lemon OR Lime or both - most Thai recipes call for Lemon Grass, but citrus (lemons and limes, along with oranges and grapefruits, and kumquats, are citrus fruit) peel, combined with the Ginger does the job just fine. Heat the oil in the pot on high and dump in the ginger, garlic, and lemon or lime peel or both and stir them around until you smell the garlic. 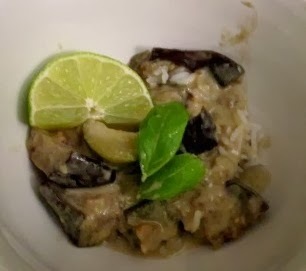 Dump in your chopped eggplant and zucchini and stir with a wooden spoon for about 5 minutes, making sure that all the vegetables come into contact with the hot oil. When they have softened slightly and the zucchini has brightened in colour, turn off the heat. Dump the veg into a mixing bowl and set aside. Pour the coconut milk into the pot heat on medium. Add the curry paste, soy sauce, and fish sauce, and sugar, and stir with your whisk until the curry paste dissolves. Bring to a boil and dump your vegetables back into the pot. Lower the heat, cover the pot and simmer it until the vegetables are tender, about 10 to 15 minutes. Dump the basil into the pot and simmer for a minute more, to let the basil's perfume come out. Serve as is or on top of some rice and enjoy! Stay tuned for the next installment when I'll be giving you my take or more hearty cold weather recipes!